Alastair Humphreys has biked around the world, crossed glacial highlands and desert lands. But in 2011, he stayed in Britain, focusing on trips close to home. The idea of backyard adventure wasn't new, but he put it in terms everyone could understand. While Alastair was perfecting the microadventure, Josh Norris and Ty Atwater were distilling down the elements of past adventure and cramming them into an all day — well, Sufferthon. Can they create Type 3 fun without leaving Oregon? Visit dirtbagdiaries.com for links to download the music from "The Sufferthon" or to hear past episodes of the podcast. 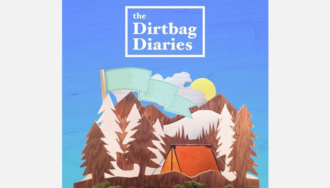 You can subscribe to the show via iTunes and RSS, or connect with the Dirtbag Diaries community on Facebook and Twitter. Happy Holidays and Happy New Year from all of us at Patagonia!